1. 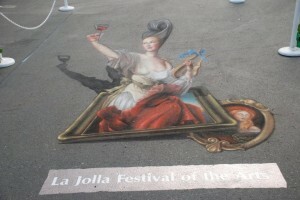 La Jolla Festival of the Arts: Held on the University of California, San Diego campus in La Jolla June 18-19, the event includes award-winning artists, gourmet cuisine, contemporary music and entertainment. 2. Taste of Gaslamp: Sample dishes from over 25 venues Saturday and Sunday June 18-19th from 1:00 – 4:00 pm on the streets of the historic Gaslamp Quarter. Attendees will also receive a take home copy of the Taste of Gaslamp recipe book featuring recipes from participating Gaslamp Quarter restaurants. 3. 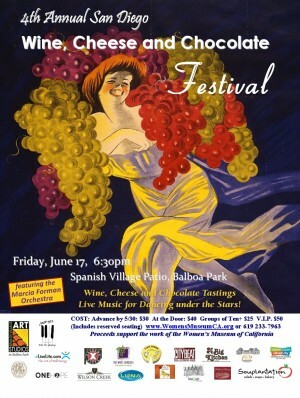 Wine, Cheese and Chocolate Festival: The 4th annual event held at the Spanish Village in Balboa Park Friday, June 17 from 6:30 to 10:00 pm. Stroll around the park and sample some of San Diego’s finest cheese, chocolate and wine while listening to music under the stars. 4. 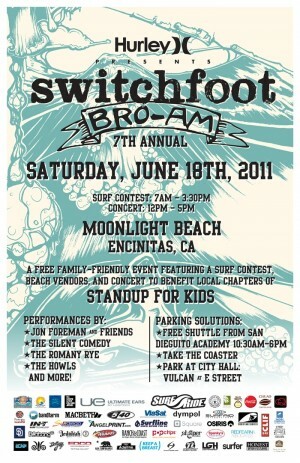 Switchfoot Bro-Am: Local Grammy winners Switchfoot put on their annual surf contest/concert/street fair Saturday June 18. The surf contest runs from 7:00 am to 3:30 pm and the concert kicks off from noon to 5:00 pm. 5. Spreckles Organ Pavilion Sunday Concerts: Attend a free concert every Sunday afternoon and Monday evenings from June 20 through August at this stately outdoor venue. 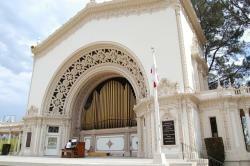 An array of musical groups will play at the pavilion located in Balboa Park. It’s a great time to pack a picnic and enjoy one of San Diego’s most unique venues. This entry was posted in Arts & Culture, Attractions, Culinary, Insider Tips, Outdoor Adventures, San Diego Events and tagged 5 to try, arts, balboa park, downtown, festival, free, fun, Gaslamp Quarter, la jolla, live music, north county by Suzzanne. Bookmark the permalink. My addition to this list would be that the Rocky Horror Picture Show is happening at the Ken Theater this Saturday night! The show is at midnight, of course! There’s a difference between the Taste of Gaslamp and Taste of Downtown.